Description: Its was about 11:30 in the morning, which is about their regular quiting time. Description: Its always a joy to see other locomotives. I could hear the horns blowing friday morning as this train came into town. We too were in the middle of an ice storm so I did not venture to the yard that day. The ice was melting away when I took these shots; in fact chunks of ice were falling on me from the trees overhead. Description: She used to service Conrail under 6117 as her reporting marks. Description: Also NS 8354(C40-8W), UP 2435(SD60M) and another UP unit 4496(SD70M) complete this locomotive quartet. 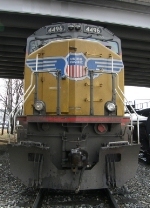 Description: NS 8354(C40-8W), UP 2435(SD60M) and UP 4496(SD70M) complete the package.